REINVENTING THE TRAIL RIDE. With aggressive, functional styling and the performance of a fuel injected Genesis 80FI four-stroke, the super-light Phazer GT is a whole new way to ride. ProActive™ rear suspensionThe Phazer GT uses a second generation ProActive rear suspension. The FX chassis uses a narrow track and the skidframe is accordingly narrower. The suspension offers a number of unique features, in addition to the narrowness. The carrier wheels on the rear upper cross shaft are oversized to improve their efficiency and reduce friction. The rear mount is built with a cantilever system to allow the track tension to remain consistent through the compression travel. The rear arm has coupling blocks. The front lower shock mount is on a cam to increase the shock rate through its travel. Excellent wind protectionThe Phazer GT has a tall winDual Sporthield and knee wind deflectors to help protect the driver from cold air and snow debris on the trail. The winDual Sporthield is mounted to the steering post, to allow it to rotate with the handlebars. Digital gaugeThe new digital gauge displays key information at a glance. Vehicle speed is displayed on a large LCD readout either in miles or kilometers per hour. 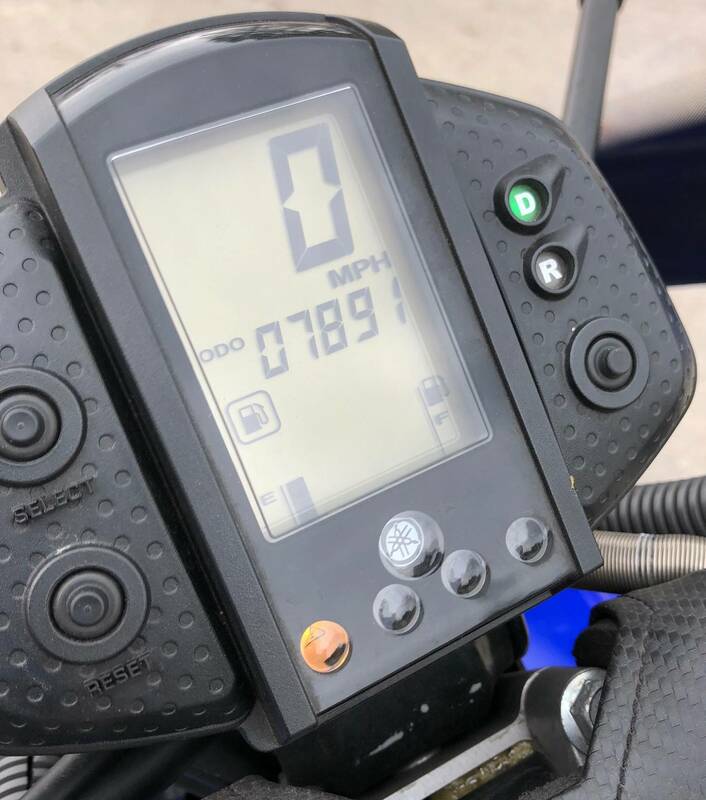 In addition, the rider can select either tachometer, odometer or tripmeter data to appear on secondary readout. The gauge also displays system warning lights, fuel level, and warmer intensity. The right hand side of the gauge has the push button for the Electric Shift reverse system. Hand and thumb warmersThe hand and thumb warmers on the Phazer GT use a new kind of control from the other Yamaha models. Instead of dual controllers, the Phazer GT’s warmers use a single rocker button on the left side control pod. It operates like a volume wheel, cycling all the way up, then starting over at low for each warmer. Tall, narrow YZ-style seatThe tall, narrow seat is an integral element in the sport rider-forward position on the Phazer GT. It helps put the rider in the best possible location for aggressive or casual riding. The narrowness of the seat enhances the Phazer GT’s overall lightweight feel on the trail. Ultra light, ultra rigid FX™ chassisThe Phazer GT is built on a new platform, the FX chassis. It features lightweight, rigid CF die cast member and chromoly tube construction. 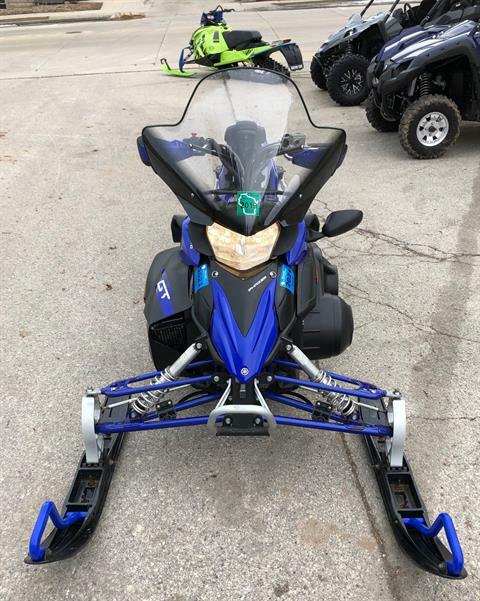 The FX chassis was engineered specifically to house the Genesis 80FI engine and incorporates that engine package in its overall balance dynamic. The FX chassis is also the backbone for the new sport rider-forward position positioning on the Phazer GT. Sport rider-forward positionThe Phazer GT takes many of its cues from other off-road motorsports, including its sport rider-forward positioning. It has a tall, narrow seat and tall, forward handlebars like the popular YZ™ dirtbike. It puts the rider in a pure sport posture, ready for anything without being overly aggressive. 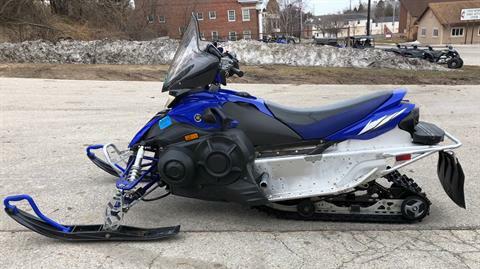 The sport rider-forward position also locates the mass of the rider right at the balance point for the sled, retaining its incredible balance. Double wishbone front suspensionThe FX chassis uses an all-new front suspension package to accommodate its unique weight distribution and handling neeDual Sport. Because of the Phazer GT’s naked front end design, the A-arms need to be longer than even the second generation design found on the Apex™ and Vector™-class models. There are also new spindles and a new sway bar for the chassis. Aluminum HPG front shocksThe High Pressure Gas (HPG) shocks on the Phazer GT’s front suspension geometry deliver consistent performance with excellent fade resistance. They are rebuildable and rechargeable for years of quality service. Integrated chaincase with magnesium coverThe FX chassis has the chaincase cast right into the frame member, and has a magnesium cover plate that forms the seal to keep the oil in. This trick piece of technology is a highlight of the goal to simplify the sled and eliminate weight. Riders will appreciate the reduced overall weight on the Phazer GT and its amazingly nimble handling as a result. CF die cast constructionYamaha’s Controlled Flow casting technique is used for many of the structural pieces on the chassis. The CF process draws the molten metal into the mold under a vacuum, eliminating the formation of air bubbles in the material. As a result, pieces can be made much thinner and still deliver the strength characteristics of a conventionally-cast, thicker piece. Genesis 80FI™The Phazer GT uses a new 2-cylinder 500cc engine for its performance. The engine package is based on the YZ250F™ engine. 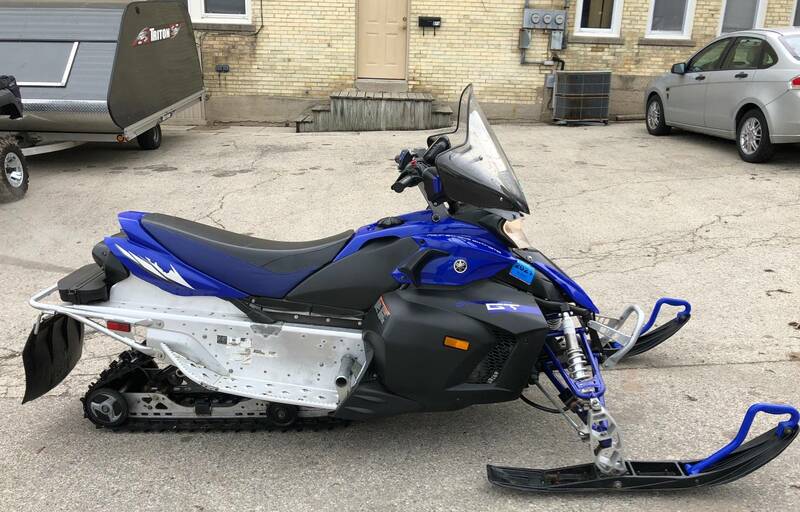 It’s actually two of them engineered together to become a new snowmobile engine. The Genesis 80FI is fuel injected, with a 5-valve head and makes its peak power at over 11,000 rpm. Lightweight, counterbalanced crankshaftThe Genesis 80FI engine’s crankshaft is designed to be light weight, responsive and durable. The lightweight, counterbalanced crankshaft delivers super-crisp throttle response and quick acceleration. It also helps mitigate the vibration inherent in a 2-cylinder engine. Advanced fuel injectionThe Genesis 80FI uses a new, advanced fuel injection system to control fuel flow to the engine. Consumers will enjoy the engine’s spot-on performance and throttle response as a result of the advanced electronic fuel injection system. 2-into-1 rear exhaustThe exhaust from the Genesis 80FI is routed out the rear of the sled, similar to the Genesis 120™ and Genesis 150FI™ engine packages. The rear exiting exhaust design serves three purposes. First, it keeps the exhaust heat out of the engine bay to allow a super-compact design. Second, it allows the engine to breathe more efficiently and through a cooled exhaust pipe. Finally, it helps to balance the overall sled package, giving the Phazer its amazingly nimble handling. 14 x 121 x 1 inch Camoplast Hacksaw trackThe Phazer GT uses a new 14-inch wide Camoplast Hacksaw track with 1-inch lugs. The new track design is lighter for improved performance and handling. It also allows the tunnel to be narrower to improve the sled’s ergonomics. RadiatorIn order to generate consistently-strong engine performance, all Genesis 80FI sleDual Sport feature a small radiator on the right hand side of the engine cab. 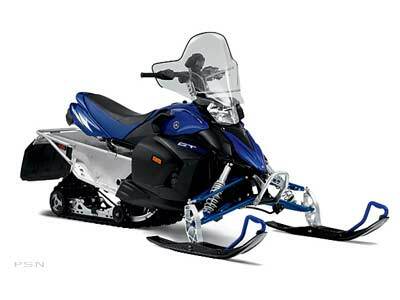 The use of a small radiator improves the sled’s cooling system function, which means greater engine durability. It also enhances the sled’s handling by relocating the mass of a rear heat exchanger up to the central portion of the sled.